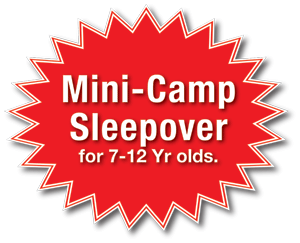 Mini Camp is an opportunity for your children to spend a weekend at French Woods to “test the waters” and get a “taste” of what a 1-week or 3-week session would be like. The cost is $100. The $100 mini-camp tuition will be credited back to you, when you sign your child up for the 2019 or 2020 camp seasons. Parents should plan to drop their children off at 10:00 AM on Saturday, June 15th. A bagel brunch and a tour of the facility, as well as a question and answer period with one of our directors await you. Meanwhile, your children will be escorted to their bunks, where they will be placed in cabins with their own counselors. Once settled, your children will be immersed in the French Woods program. On Saturday, they will take part in two activities before lunch and three activities before dinner. Saturday evening will be filled with special evening activity events including a make your own sundae and pizza social topped off with the music of our terrific DJ. On Sunday, Father's Day, after the three morning activities, you will be reunited with your mini-campers for lunch. Bring your bathing suits because our poolside activities are always a big hit. Also, bring your tennis racquets and spend some time on our courts. See our accommodations list if you would like to spend some time in the Catskills, while your children experience French Woods. Click here to apply online for this wonderful opportunity (or call us directly at (800) 634-1703). Please fill out and submit the application to us ASAP. We are limited to the first 50 children that sign up. Remember, Mini-Camp is for youngsters 12 years old and younger who have never been to French Woods before. If you have any questions, please call us at (800)634-1703.